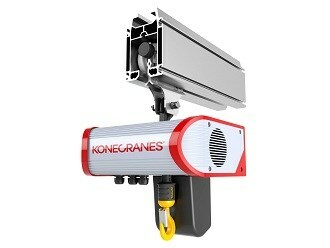 A new-generation electric chain hoist designed to meet and exceed the most rigorous reliability, safety and efficiency demands of diversified industrial users is being released in Australia and New Zealand by Konecranes. Konecranes' CLX chain hoist is designed for applications where reliability, safety and efficiency are critical. The new CLX chain hoist – winner of the Red Dot design excellence award - incorporates a longer life-time, with up to 1,600 hours on most models with a full load, and a durable aluminium construction. The new, steel-framed and sturdy CLX chain hoist is particularly suitable for individual work-station applications, such as assembly cells, and in workshops extending across industries such a mining and resources, metal working and manufacturing, and vehicle and plant maintenance. Other applications include jib cranes and electric overhead travelling (EOT) cranes. Durability of the lift chain was a key element in the CLX’s design for outstanding service, the company says. The patented chain sprocket dramatically improves the durability of the chain. The chain sprocket’s transmission has been completely redesigned. The new, oil lubrication-based transmission reduces the operating temperature, enabling increased power. Furthermore, the new transmission is maintenance-free and much quieter to operate. The CLX’s new transmission increases the speed ratio between low and fast speeds. The new 6:1 speed ratio enables a safe and accurate installation speed and an extremely fast movement speed. The wider speed range makes the CLX chain hoist 25 percent faster than its predecessor, which helps speed up the work cycle and improves work efficiency. All components that require maintenance are easily accessible and do not require the removal of any parts. All electronics are located compactly on reliable circuit boards, minimising the amount of internal wiring compared with the previous model. The new design solutions make the maintenance work significantly easier and faster. Safety functions have been integrated into the standard characteristics of the hoist. For example, the brake and the clutch have been installed on the same axle, which prevents the load from dropping even if the clutch breaks down. This feature takes the safety of the CLX chain hoist to a completely new level. In addition to functioning efficiently over an extended temperature rang - it now operates at -20 degrees to +50 degrees - the new-generation CLX chain hoist has been designed to be energy efficient and meet all the requirements of the global Restriction of Hazardous Substances (RoHS) Directive. The hoist’s circuit boards do not contain any hazardous lead as soldering material, just one example of the hoist’s eco-friendly features, says Konecranes. Three versions of the CLX chain hoist will be introduced initially: Type CLX02 with a lifting capacity of 63-32 kg; type CLX05 with a lifting capacity of 250-630kg; and type CLX10 with a lifting capacity 500-2,500kg. Konecranes Sales and Marketing Manager Warren Ashton says the new chain hoist is designed to perform in applications where reliability, safety and efficiency are critical. "Konecranes CLX Chain Hoist is a reliable lifting device that increase performance and adds customer value through innovative technology and design, extended lifetime expectancy and high safety," he says.